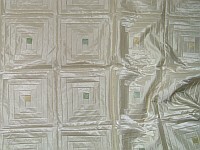 Bedspread patchwork - satin (cotton and viscose) and synthetic lining. Additionally 1 or 2 pillowcases ( 2 for bedspread's size greater than 200x210 cm). It can be machine washable at 30 st .